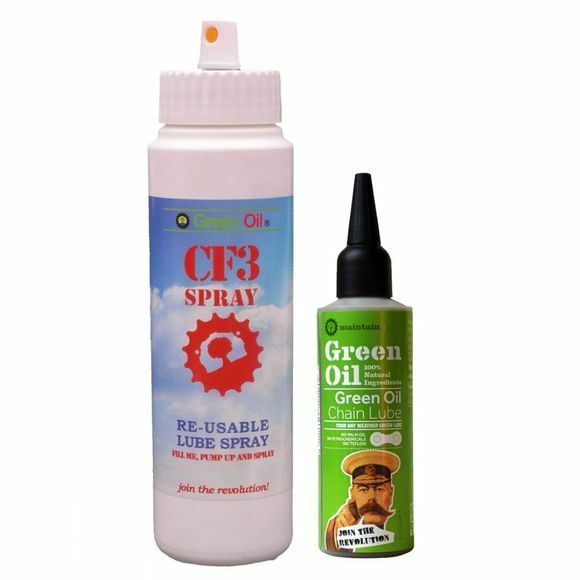 The Green Oil CF3 re-usable lube spray lets you spray Green Oil onto your bike. It can also be used with White, or Clean Chain degreaser. It uses air pressure rather than harmful propellants, and with this pack we are giving you a bottle of Green Oil chain lube. Green Oil chain lube was developed in 2007, and is the country's if not the World's first biodegradable bike chain lube. It lasts in excess of 100 miles on the chain per application (depending on conditions) and has won a wealth of awards - from environmentalists and the bike industry alike.